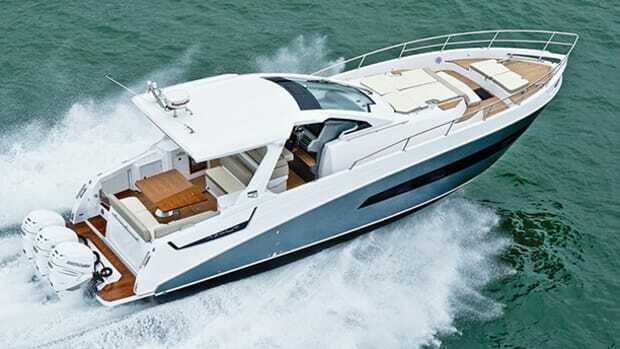 This beautifully proportioned yacht tickles our aesthetic fancy with a handful of unique details. Plus, for a 77-footer, her speed promises to raise the hairs on the back of your neck. The high level of skill in modern design has sent everyone scrambling to give owners something to crow about at the yacht-club bar. 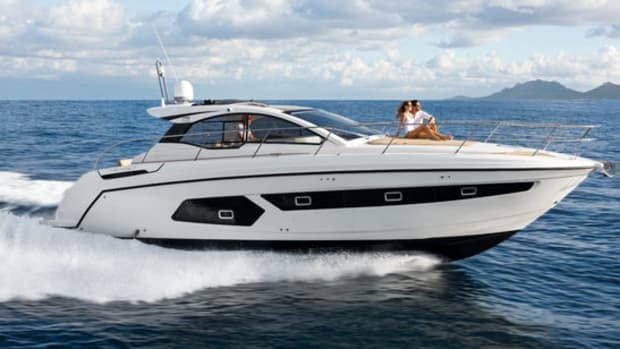 For the most part, the basic shapes of the boats are similar, likely because customers expect their purchase to fit into the mainstream so the resale value stays respectable. Design teams, then, must use innovative aesthetic details and interesting general arrangement plans to distinguish their creations. Azimut has been consistently good at this practice. Stefano Righini is responsible for the 77S’s concept and exterior design, and he’s followed the current trend of combining nautical and automotive themes. 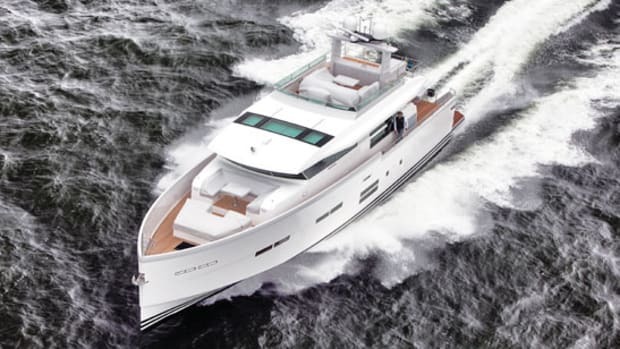 In a profile view, for example, we see a subtly curved foredeck blending seamlessly into a mouthwatering deckhouse. It reminds me of a Maserati GranTurismo coupe, but the plan view (from above) reveals a spacious lounge/play area that houses a sunpad forward and a dinette just aft. When you’ve moored stern-to, this area provides a lovely escape from the prying eyes ashore. 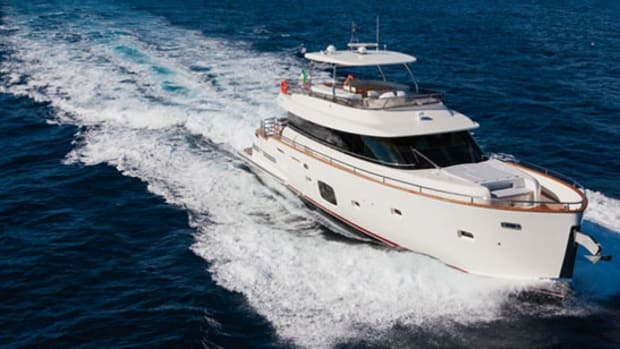 This yacht is large enough to include useful side decks and bulwarks within her high style, and combined with sturdy handrails, they add to the safety of moving forward and aft while the boat’s underway. 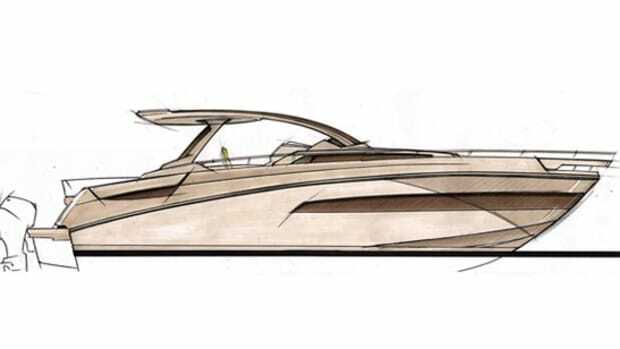 If you appreciate design, you’ll agree that Righini has drawn a lovely superstructure. Anchored by a structural member, which adds a bit of character to the side windows, the house arcs gracefully over the saloon and provides a perch for a slick flying bridge. 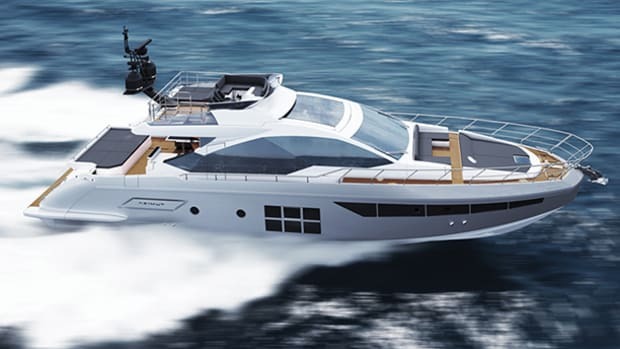 Yachts nowadays have become a microcosm of the owner’s recreational lifestyle, and builders have responded to the customers’ wishes with spacious and tasteful interiors. 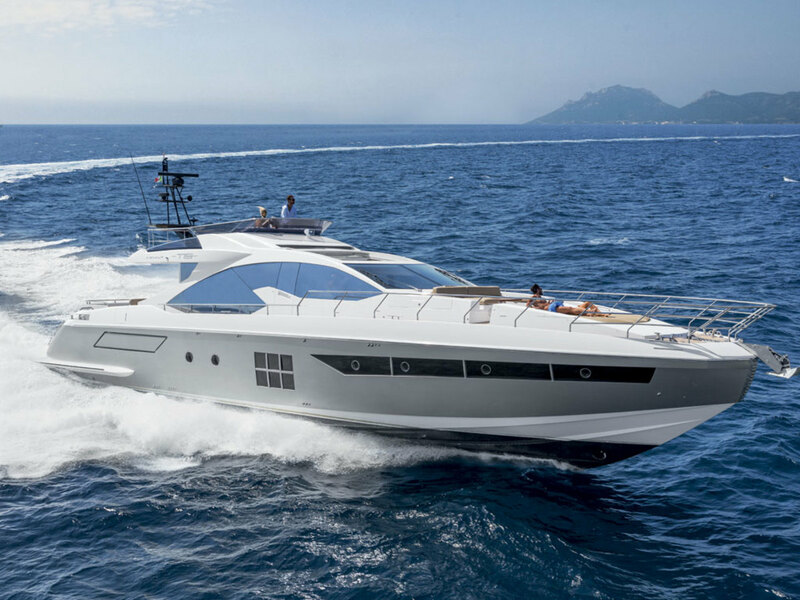 Carlo Galeazzi designed the interior of the 77S and has taken full advantage of the uninterrupted space belowdecks allowed by the use of pod drives. 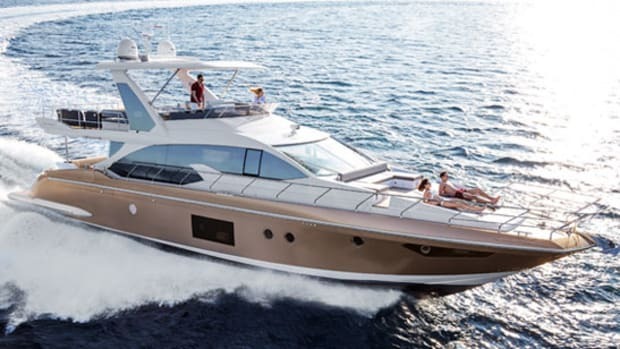 The three Volvo Penta IPS1200s live way back aft, making room for ancillary machinery and the crew’s quarters between the power and the full-beam master stateroom. Crew members come and go via a private staircase to the afterdeck. The galley, two guest staterooms, and the VIP cabin fill the remaining space on the lower deck. 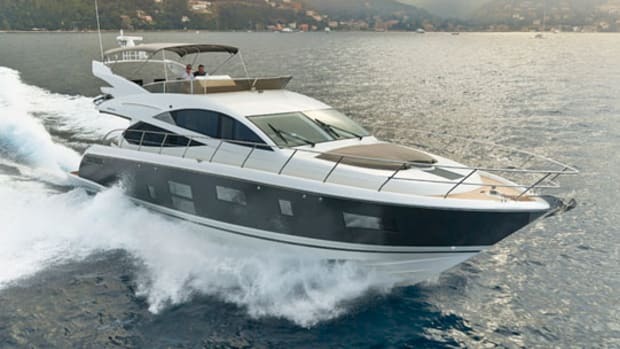 Social life aboard the 77S will take place in the large and very well-lit saloon and on the afterdeck. Simple lines define the furniture, and the symmetrical arrangement makes the best use of space. 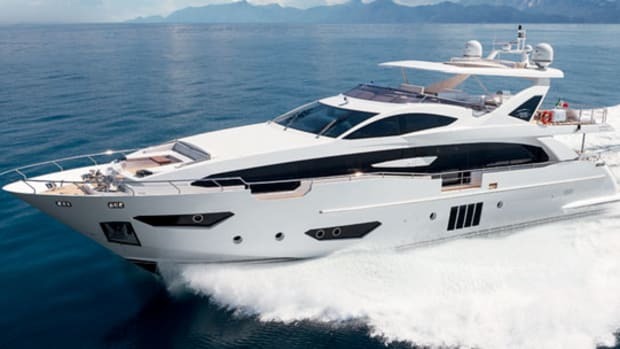 This yacht ought to be an altogether grand way to spend one’s days on the water. Stay tuned for a more in-depth look at her in a future issue.